The ELD Mandate is here. December 17, 2017 is the day set by the FMCSA (Federal Motor Carriers Safety Administration) requiring ELDs (Electronic Logging Devices) for interstate commercial trucks. But where do you start and what should you look for in an ELD, and are there benefits to switching from manual logs to elogs sooner than mandated? 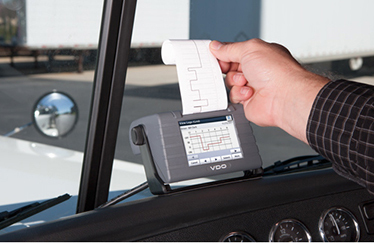 In this article, we discuss the VDO RoadLog ELD from Continental and the features that Owner Operators, fleets, and even roadside inspectors, say they appreciate the most. Before we get into the specific features, it’s helpful to know is that the VDO unit is available in two models. The VDO RoadLog ELD (with no monthly fees) and The VDO RoadLog ELD PLUS with Cellular Connectivity. The main difference between the two is that the PLUS version allows drivers to wirelessly upload data and requires a monthly fee if activated. The version without cellular connectivity requires the use of the RoadLog Driver Key (usb drive) for manual data transfer, but requires no monthly fee. The fact that it’s easy to use and affordable has made the VDO RoadLog popular among owner operators and small to medium fleets. There are no monthly fees or contracts, as we discussed above, for the regular RoadLog and drivers can manually transfer data through the driver key. This works very well for Owner-Operators with 1-10 or so trucks. Fleets over 10 vehicles, or thereabouts, may prefer the wireless version (the RoadLog Plus) which will give their drivers the ability to wirelessly upload their data for an affordable monthly fee. TIP: Maybe you’re a small business now, but you are growing and are trying to decide between the unit with or without cellular connectivity. Choose the RoadLog PLUS with cellular connectivity. You can turn off the cellular connectivity for now and still pay no monthly fees. Just activate it when you’re ready to move to wireless. When going through a DOT roadside inspection, we all want to hear the “You’re good to go!” from the inspector as quickly as possible. And the built-in printer helps that happen. Simply print your logs right from your truck, and hand them to the compliance officer – the same as you’ve done with manual logs. The printout is similar to the log book style so the inspector is able to quickly view the data – making the printer a feature that the inspector appreciates just as much as the driver. The printout immediately eliminates any technology compatibility issues with having to transfer/display data electronically at a roadside inspection. And, because it is a thermal printer, it never requires any ink. 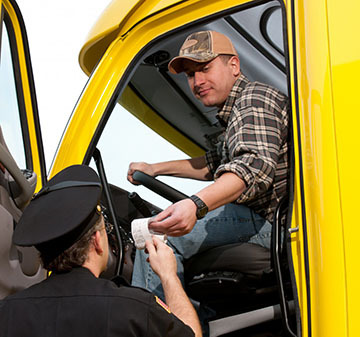 Simply print your logs right from your truck, and hand them to the compliance officer. Keeping up to date with the most current FMCSA regulations is automatic with the VDO RoadLog. When there’s a change to an FMCSA regulation your VDO software will update to reflect the latest regulations. 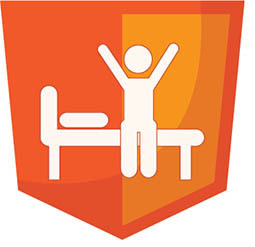 As a registered VDO RoadLog user, you can rest assured you’re always in the know, and in compliance. If you’re about to exceed any of the upcoming limits, it will even send you an alert letting you know — helping you steer clear of compliance violations and fines as much as possible. Because fleets may receive more favorable insurance rates if they can show that their drivers are operating in compliance, it benefits them to hire a driver who is already ELD equipped. These drivers are able to show that they operate safely and within compliance and can have a positive impact on a fleet’s CSA scores. Additionally, it can give a driver an advantage when it comes to receiving the best loads from their favorite carriers. For many drivers, this advantage has been their motivator for going ahead and making the switch from paper logs now. Use the VDO RoadLog not only for tracking Hours of Service, but also for recording a whole host of other data automatically. Data, such as DVIR (Driver Vehicle Inspection Report), IFTA (International Fuel Tax Association) and IRP (International Registration Plan) is also captured and provides a complete FMCSA compliant report you can use to run your trucking operations safer and more efficiently. Automatically capture Hours of Service, as well as other data such as DVIR, IFTA and IRP. Air Ride Truck Seats – A Driving Force in Your Comfort. Today’s heavy duty trucks can be quite sophisticated with many cutting-edge, hi-tech products behind the wheel and under the hood. At Ryder Fleet Products, we continuously research and meet with industry manufacturers and suppliers to discover and bring you the latest advancements in truck technology. This time, our focus turns from technology for the truck to technology for the driver. Driver comfort, we all know, is paramount to a safe, healthy and productive driver and it all starts in the driver’s seat. And today’s driver seats are quickly evolving beyond the regular factory installed seat to an ergonomically designed seat with options such as lumbar support, side bolster support, seat tilt, extendable cushion seats, memory height, and even heated seats to perfectly support your body as you drive. To offer our customers the best in premium air ride seats, we have partnered with Prime Seating, Inc., located in Duluth, GA. These specially designed and engineered air ride truck seats are made for both medium and heavy duty trucks (and buses) and use the latest technology to promote a healthy driving position. The seats range from a 200 series to the fully luxurious 600 series. Each series has different options, and in this article, we break these options down for you so you can easily compare one model to another. You can see all the Prime Seat series offered by Ryder Fleet Products by visiting our Prime Seating page. First let’s discuss some basic information that is helpful to know as you begin your research and comparison. These seats come standard with the 4.25″ tall mounting base. A lower 1.75″ mounting base is available upon request at no extra charge. The short base is popular for those who want the seat to settle to a position closer to the floor. Each series (with the exception of the 600 series) is available in either cloth or leather. A “C” after the series number (i.e. 200C) indicates the cloth version and an “L” (i.e. 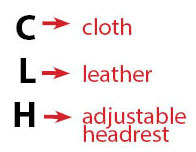 200L) indicates the leather version. A useful thing to note is that there is no price difference between the cloth and leather options. All of the leather series are made from a very soft, high end synthetic leather, with the exception of the 600 series which features a natural leather. An “H” in the product name (i.e. 300LH), lets you know the seat is a mid-back seat and features an adjustable headrest. All of the seats come with a 3-year warranty on the foam and cushions and a million mile or 5 year warranty on the seat structure itself. The seats are simple to install and should take about 15-20 minutes. Let’s go over each of the series in detail now. As we mentioned, they start with the 200 series and go on up to the luxurious 600 series which boasts not only heating options, but a cooling option as well. The 200 series (200C for cloth; 200L for leather) offers an innovative seat with a fully reclining backrest and dual arm rests. It also features an air height adjustment, fore/aft slide adjustments (to position you closer or farther away from the steerling wheel) and fore/art isolator – lock/unlock feature. You’ll find the 200 series a vast improvement over the standard factory installed truck seat and you’ll notice a welcome difference in your driving comfort. This series offers everything the 200 series offers PLUS the following upgraded features:upper and lower air lumbar support (great for bad backs), side air bolster support, adjustable seat cushion extension, and an adjustable tilt. The 300 LH is a mid-back profile seat with an adjustable independent headrest. The 400 series features everything from the 300 series plus two additional comfort options: 1) an adjustable shock absorber setting which lets you choose from 11 different settings (from soft to hard) so you can adjust your ride to road conditions. 2) heated seats – both bottom and back. The 500 series is the 400 series model with the addition of 2 new features: 1) memory height setting – simply adjust the seat to your preferred height initially and it automatically resets to that height each time you enter the truck. 2) A quick release button allows you to dump and refill air with a one button push in/out. Like the 300 and 400 series, the 500 series also offers the 500 LH -a mid-back profile seat with an adjustable independent headrest. The 550 RH-BUS. This seat is for buses and has all of the controls on the ride hand side of the seat. The 600 SERIES – All the bells and whistles! The 600 series is available only in a premium natural leather. They’ve taken the 500 series and added one of our favorite features – a cool air ventilation system. This provides cool air throughout the backrest and bottom cushion and provides relief from hot sticky seats during the summer months. View the 600 series. Download the 600L flyer here for more details. 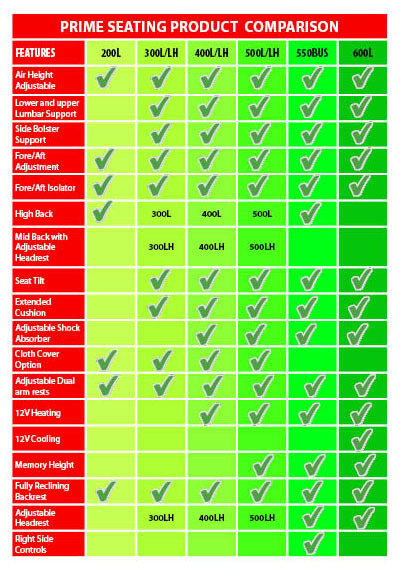 For a quick side-by-side comparison of each of the series of air ride seats, we’ve put together the following chart so you can easily compare the features between each series. 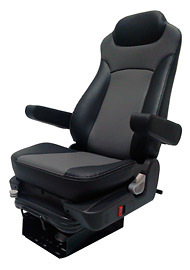 Find the air ride truck seat that’s perfect for you at Ryder Fleet Products. And enjoy FREE SHIPPING for orders over $250.